Did you happen to catch Nintendo’s conference this week? In an online presentation to the world they proudly announced that the sky is blue, that snow is cold, and baby bunnies are one of the cutest things on earth. In an additional round of stating the bleedin’ obvious, they revealed that they were developing Zelda, Mario, Mario Kart and Smash Bros. games for the Wii U. Who would have believed it? Sarcasm aside, whilst this news is going to surprise no one, their need to tell us seems only to point to desperation. With no footage on show of any of those four titles, it served more as a reassurance to Nintendo die-hards that their needs will be serviced in time rather than a proud unveiling of upcoming products. Perhaps worried about the ever-rumoured next gen offerings from its rivals it felt the need to seed its E3 offering earlier than ever. Although with next to no details behind any of them they appear just to be courting headlines. The disappointing aspect of this for me was that these rather vacuous announcements hid far more exciting titbits. Nothing to do with a Wind Waker remake, fresh looks at Wonderful 101, teasers for Bayonetta 2 and a proper reveal in the form of a new Yoshi game all piqued my interest. Plus offerings from Monolithsoft and other developers close to Nintendo. Wonderful 101 (formerly Project P-100) appeared full of pizazz, seemingly mixing Pikmin, Earth Defence Force and Saturday morning cartoons; Bayonetta, though not showing any in-game footage, showed sass that is much needed on the platform; whilst Yoshi returns for his first home console outing for 15-years. And coming from the director of Yoshi’s Island and the team that brought us Kirby’s Epic Yarn it makes me smile at the very thought of what they’ll dream up. The snippet on show looked like they’d used a woollen Yoshi and stop-frame animation and looked gorgeous. Of course, if you watch the whole presentation the Marios and Zeldas received very little air time, and yet merely dropping them in there seemed to do a disservice to games that did have footage or interviews. News such as this was obviously going to trump anything else but with no clips or release dates anywhere near them they seemed a cheap shot. Half way through Iwata actually apologised for the lack of releases. Anyone with any previous experience of launches knows that developers work ridiculously hard to make a launch window, and if there’s any chance of doing so will burn the midnight oil to get their games out for that crucial period. As such, the next few months tend to be slightly barren, with those failing to make it out in time instead choosing to relax slightly and make their wares as polished and refined as possible. Gamers expect that and what they should be shown are games available in the next few months, not years. In a barren period reassurance is what is needed that they’ve made the right choice. Whilst I in no way regret my Wii U, this Nintendo Direct does dent my confidence about it being a force in the short to medium term. Where do you stand on 4k tellies? You know, about the only thing to make a big splash at CES this year? The television with four-times the definition of 1080p? Safe to say they’re still in their infancy, costing multiple thousands of pounds, but it doesn’t stop the tech lover inside me lusting after one. As soon as the current HD standard dropped below a certain price point I leapt at it, and I can still remember that joyful day that I took off from work awaiting its arrival. At the ready to test it I had the original Dirt, the much maligned Shadowrun, and the company’s HD-DVD player complete with King Kong. Though I’d experienced HD content first-hand many times before, the fact that it had now made its way into my living room made me incredibly happy. The crispness of Dirt, the clarity of the panoramas in King Kong: oh my. But will it be the same for 4k? Will there be that noticeable leap there was as we went from CRT to HD? Sadly, I don’t think there will. After poring over the specs, ignoring the prices, and wondering what a suitable size television would be to complement the newly installed rabbit hutch in our living room, someone pointed me towards this article. Relief for my wife as 4k appears to be completely unnecessary in normal living room conditions. Scientifically speaking, at a normal viewing distance, your eye will not be able to pick up the individual pixels on offer at such a high resolution and thereby wasting its efforts. Worse than that, most people cannot tell the difference between 720p and 1080p; and I’d probably have to lump myself into that category too, in most cases. The new spec is really only going to benefit those with huge 60” plus televisions, but my fear for the forthcoming console generation is that it won’t matter a jot. Looking back over this current generation then we see consoles boasting 1080p capability – remember the ruckus at the start when Xbox “only” supported 1080i? – and yet how much has that actually been used? It seems most games are quite content to render at a far lower mark than that and use the internal upscalars to produce an ultimate 1080p output. My worry is that without the dream of 1080p fully realised, a distraction by 4k could once again lead to unfulfilled potential. With the more glitzy devs striving for “Full UHD” rather than concentrating on what I hope will be the next generation goals of building richer worlds and not just higher-def’ed ones. With the increase in the power in the next generation I’d much prefer to see it spent on more interesting AI, more populated cities, deeper experiences, rather than yet another lick of paint. Probably the saving grace will be that 4k will simply be beyond most games as the sheer power required to handle such a signal is deeply meaty. Let’s say most games render natively (before the upscale) at 720p; to render at 1080p uses roughly twice the number of pixels and therefore twice the power. Using the same logic for 4k, that’s a further four times the umph required. That’s going to be a hell of a rig to power that. And just think what else could you be using that for? Still, I and others can pour as many numbers at you as we like, but nothing quite dampens the allure of a shiny new screen. Why let facts get in the way of a potential new toy. Once upon a time you’d have probably called Mulder and Scully to a first contact situation. Not sure how they’d have coped though if the aliens came down, mind controlled the ginger one and then shot the Dan Petrescu impersonator in the face with a plasma gun. Nowadays, we need not worry. The nations of the world have united and formed XCOM to defend the earth from alien invasion. Watch as I take the role of squad commander and leads the world’s finest (or at least those he hasn’t already lead to their deaths) through another UFO landing. Some time ago I did a “day in the life of” for the Rare website. It was just after Viva Pinata released, which should date it suitably, and I spoke of my time bug fixing, the fresh VP community and my general duties. Time for an update and after the Rare Editor approached me I refreshed things. Plus it’s a great excuse for that photo to reappear. It’s about time we introduced the new member of the Thomas family to you. Please welcome Hershel, out new little bun. After a long while without the pitter-patter of fluffy feet around the house we felt it was time to rectify that. 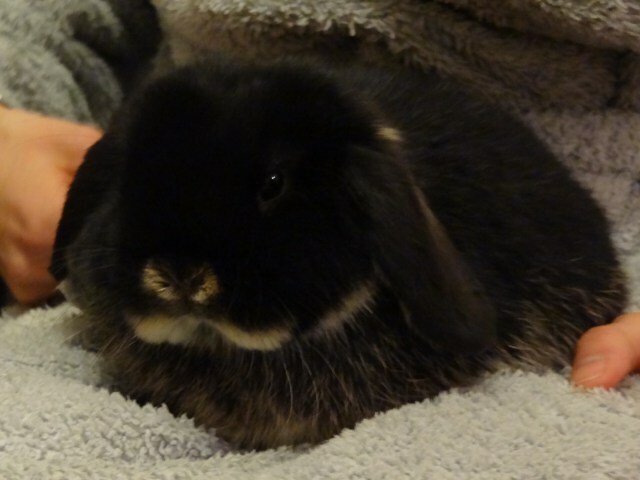 So in a whirlwind week, that saw us going from indecision to rushing between pet shops and garden centres before closing time just to get the right hutch in time for a Sunday bunny delivery, we’ve adopted this littel lop eared fellow. And we do mean little; he’s only ~8-10 weeks old. Once again there’s a hutch dominating our living room but the loss of space is more than made up for by Hershel’s first timid steps round the living room. Or at least the couple of square foot in front of his hutch. Back in August I walked away from my brief bout with ZombiU distinctly unimpressed. An unresponsive combat mechanism and a clunky interface did nothing but alienate the user. That was no slight on the novel hardware (I’d just had a great time with Rayman on the same device), but rather the blame solely lay at the door of the developers. It was Red Steel all over again. However, come the start of December, when I buckled horribly and broke into my penny jar to get a Wii U, I still held onto the hope that an extra couple of months incubation could turn things around. Yet even after playing through it, the answer isn’t clear cut. Straight out the gate you’re still faced with the same punishing slowness that greeted me in the demo. Your movements are casually paced considering the undead are right on your heels, and you swing a cricket bat with such consideration that you’d expect the zombie’s skull to find the gap and head to the cover boundary for four. It feels wrong; there’s no urgency to any of your actions. The difference between this and the demo however is that you have time to adapt. Fresh to the controls and asked to take down a veritable cavalcade of cadavers you would die horribly and repeatedly. At home, however, you have time to learn the nuances, adapt to the lethargic rise and fall of the bat, and find your feet in the world. Very aware of this, the early stages almost spoon-feed you zombies one by one in as low a risk situation as possible to get you used to it all. Of course, low risk is a relative term. A single zombie on their own can be handled simply, easily pushed back and pummelled into submission, but it can still rip your throat out in an instant should it slip pass your defences. It’s a game where – and I found this out on a handful of occasions – a lack of concentration can see the end of your adventure end before you can recover. It makes you approach every situation and each new room with caution as you learn to both fear and respect the undead. Tackling more than one target at a time needs serious consideration as wading in waving your bat will only buy you slithers of time. If possible, outliers need to be dealt with first, or sensible use of flares (zombies like light, it turns out) paired with grenades and fire bombs to get rid of groups. These are no silver bullets, however, and a looseness in the controls never guarantee that these tossed objects end up where intended. Should things go even slightly awry, genuine panic can set in as you know that your default melee weapon is next to useless against multiple assailants, and running might only delay the inevitable. As a fall back you do gain access to a series of guns, but this is no Call of Duty. As you play a member of the general public you have no formal weapons training and that tells in the aiming. Headshots will not come from popping a dot over a zombie’s bonce, they either require a splash of luck or for your enemy to be virtually on top of you. Not something to be advised. Helping out in the quest for survival is the Wii U gamepad, acting as your inventory and your radar, each equally adding to tension in their own unique way. The former allows you to switch which weapons you have quick access to, though never pausing the game. Whilst digging around in your backpack the camera swings round to show you against the background. Even if there are no actual zombies in sight they play on the mind, and if there is then, boy, does that pile the pressure on your fingers to pull out the right item; flourishing a chocolate bar won’t quite work the same as a Molotov cocktail. When not rejigging your weaponry, the second screen alerts you to local threats. Creatures show up as red blips, allowing you to prepare for what’s round the corner. Yet almost cruelly it’s not just zombies but rats and crows, meaning you’re never quite sure what you’ll be facing. The sonar can also function as a scanner to try and help differentiate these from a distance, but line of sight is still required. Despite that, wandering down a corridor to suddenly hear a blip emanate from the pad can cause you to pause, whilst the sound of a chorus of blips reporting back can do more than that. What all these component parts have in common is that none are flawlessly implemented. The inventory management can seem needlessly convoluted, your actions dawdling, the story full of holes. Respectively they have rough edges, minor failings that whilst never jarring are obvious enough to make you wish that ZombiU had had just a couple of extra months to get an extra level of polish. But by the same token they also add to the levels of tension and drama. Not since the original Resident Evil or Fatal Frame have I felt truly unnerved playing a game. There are no cheap jump tricks on display here, the pressure and tension come from being pitted against a world that has gone to crap and the only object that you can truly trust is a faithful piece of English sporting equipment. The knowledge that you simply respawn back in your Safe House as a new character – though having lost all your backpack’s content – should the worse happen, does little to calm the nerves as you’re trudging around an unmapped sewer with a handful of blips that you prey turn out to be small and fluffy. It’s a game that seems to have been built out of equal parts luck and judgement. For as much as I think the slow nature of the cricket bat’s rise and fall is a very clever feature, forcing you to truly understand combat and not just swing out wildly, there are many others that just raise questions as to how they settled upon that as a solution. Although either way it does not matter. Rather than question why what you’re playing is compelling there are times you should just stop over analysing things and settle in and enjoy it. At this time of year, as the Christmas trees come down and attentions turn to hot cross buns, award ceremonies are ten-a-penny with every magazine, show and website handing out accolades left right and centre. And by golly by jingo we want to get in on the action. So whilst more reputable publications hand out Game of the Year plaudits, we present you with a list of those titles that have proven themselves enough to make the resurrected BIGsheep Birthday Honours. At Gamescom ZombiU and I did not get on well. In a noisy hall, shoulder to shoulder with fellow gamers, I attempted to get to grips with a seemingly clunky, cricket bat swinging survivor of the zombie apocalypse. He wasn’t a survivor for long. Neither was the next chap. Or the subsequent poor lady. In the comfort of my own home, however, Ubisoft’s Wii U launch title came into its own. It wasn’t a game to excel on a show floor, but a considered title that required patience. In return it repaid you with a unique experience that could crank up the tension by merely placing a pair of blips on your radar. In an era where most games seem to be going for a more instantly accessible and, some may say, dumbed down mainstream experience, ZombiU embraces being slightly obtuse. Now whether this is a design masterstroke or a pure accident it’s hard to tell but it’s come from nowhere to be the most surprising title of 2012. Honourable mentions: Wii U, PlayStation Plus’s instant game collection. For a handful of us, our April was consumed by talk of glyphs. We had notebooks and smartphones full of pictures and scribbles as Phil Fish’s mind boggling platformer took over our mental faculties. It started simply enough, presenting itself coyly as an 8bit indie darling. Slowly, however, the truth was revealed and not only was it an inspiring mix of retro visuals and stirring platforming but a vessel that contained an entire new language that had to decrypted. There was no bluntness to it, though. The language was part of the world, etched into the walls, with a subtlety that meant when its importance was revealed it made you look at the world from a completely different perspective. As a concept it may not be revolutionary, but EA’s latest incarnation of the beautiful game is as polished as can be. Part of that comes from the various game modes: grouping each club’s supporters together and charting shared success; a collectible card game where you put your best Panini stickers against a friend’s; or online leagues that shows the best implementation of “True Skill” since Halo 2. In the last twelve months though there has been no multiplayer experience that has topped getting half-a-dozen friends together and marching out onto the virtual pitch. Each of us takes a position – I like to think of myself as the digital Scott Parker – and attempt to work together in sync, watching for each other’s runs, sliding through through-balls, and hopefully working goals that even Messi would be proud of. Though sadly the opposition seem equally adept. The swines. If there was a period that sold me on the Wii U it was the Monday lunchtime right after it had launched. A colleague had brought the machine, Nintendoland and a bagful of Wii-motes into the office and an hour later I was plotting a visit to GAME. Some may say that Nintendoland doesn’t sell the Wii U as well as Wii Sports sold the original Wii, but that’s beside the point as the Luigi’s Mansion mini-game is almost worth the price of admission alone. A simple collection of games based around almost playground concepts, the collection excels at stripping away overly complex controls schemes and allows players to revel in the glee of tig for the modern era. There are duds, but most either excel in multiplayer or reveal a surprising amount of depth or challenge when tackled solo. They’re simple, but when simple is done so well why overcomplicate matters. I’m always a sucker for technology that verges on the novelty. Last year’s obsession with Skylanders and its Near Field Communication toys proves that out. This year it was Sony’s Wonderbook that won me over; effectively a giant set of Augmented Reality cards bound in a cover and combined with an Eye-Toy. As always, though, it’s how it’s used that makes it wonderful. Wonderbook’s ability to turn your room into a classroom at Hogwarts is achieved by more than simply rendering dragons on your coffee table. You get sucked into the magical castle, shown tiny paper-based dramatizations of spell’s histories, and transported to fantastical locations. At each you flick and swish your wand complete with all the sparkles you need to levitate toads and set Deatheaters on fire. It may also help that there’s a Walking with Dinosaurs tie in coming later this year. Honourable mentions: Vita, PlayStation Plus, Game Boy Camera. Sometimes a glassed walled lair hidden beneath a manmade volcano just has to be made. Then of course when that’s completed it needs attaching to the mine cart network so you can speedily reach the giant floating castle. Well, that would be if my giant floating castle hadn’t burnt down when I installed the fire pit. Next time: don’t use timber. With each new construction the late nights were worth it. Not since Banjo Kazooie: Nuts and Bolts have I had a virtual Lego set that kept me up to the wee small hours as walls needed finishing, ponds needed digging, and giant squid needed herding. Possibly the hardest fought category but by a smidge Tokyo Jungle made my mind boggle most. The sheer bizarre concept of playing as a Pomeranian, savaging cattle and courting flee infested mates doesn’t sound like a winner, but it worked. It felt like a modern incarnation of Double Dragon but when you take into account the story behind the animal adventure the mind truly boggles. Time travels, future humans trying to save themselves by sacrificing the past, and golden retrievers declaring themselves king… I’ll never slag off the Halo storyline again. Honourable mentions: Frog Fractions, Fez. Hands down this was by far and away the best game, nay experience, I’ve had all year. It combined charming, mute characters with wondrous landscapes in a platform-come-pilgrimage that saw you gracefully slide down sand dunes, scale snowy peaks and soar through the blue skies above. It constantly changed, but never felt forced or jarring in its transitions just that it always wanted to take you on a new adventure. More than that, however, it touched me emotionally. The beautiful story conveyed in such minimalistic ways joined with an online cooperative experience that seemed so unique but equally compelling to everyone I spoke to was moving. It may only be a few hours long but that time can be held up as the finest time that can be found in our hobby. Christmas has obviously been and gone as 7outof10 has some new toys. Marvel at our ability to capture footage from both screens of Nintendo’s new console whilst at the same time walking and talking you through the scariest of its launch line up. Grab yourself a pillow to hide behind; it’s Zombi-U.